So this week we finally made it to La Bougainvillea for lunch ! 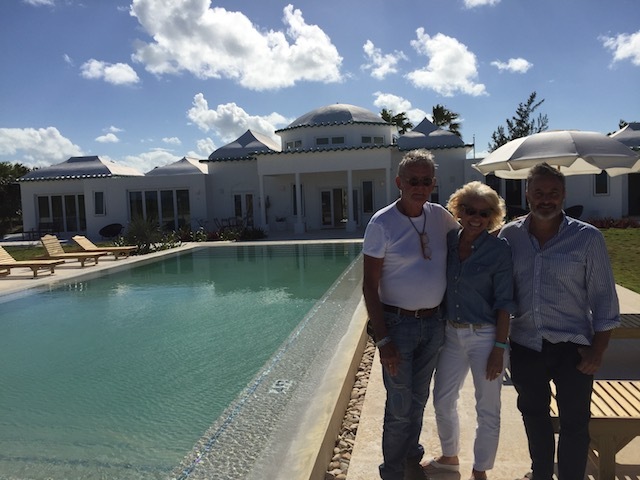 What with cool breezy weather and an overpacked schedule it has taken us some time to visit Eleuthera’s latest venue – but it was worth the wait and we ate a beautiful lunch there the other day. Tom Marazza is the owner and in fact has owned the property for around 13 years. Until recently La Bougainvillea was a rental property along with 7 Palms right next door. But now it has been turned into a small boutique hotel with the restaurant as well. There are 5 rooms – all very elegantly and simply presented – white , immaculately clean and very stylish with an island flavor…. 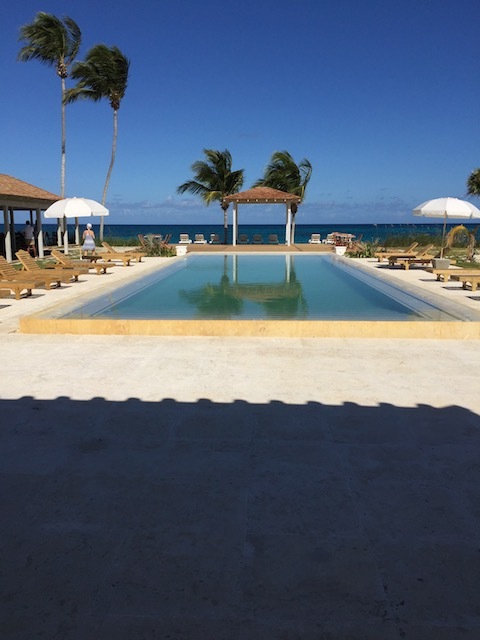 The property has been designed to host large wedding parties and functions – there is a large outside bar and undercover area as well as a great dance floor…..
Now that’s a pool ! 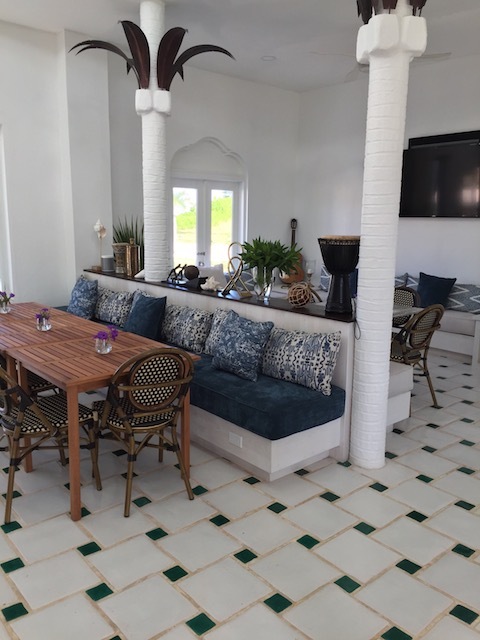 The designer in me could not resist a picture of the cast concrete bar with conch section set in it…..
7 Palms – with 7 bedrooms – continues to be a rental property and is ideally situated for a short stroll over to enjoy lunch or dinner in the restaurant. You can eat either inside the unusual Moroccan style house or outside – in the shade with a view of the Atlantic….. 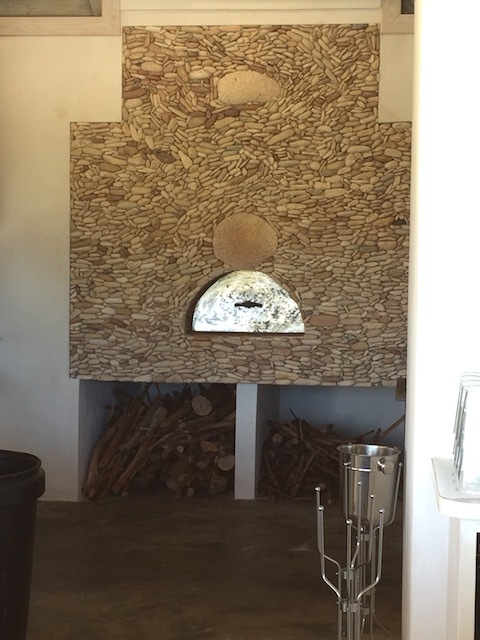 The pizza oven with brilliant stonework by the artist Celes – well known and revered on the island for his beautiful work….. There is an outdoor pizza oven and pizza night is on a Thursday – another reason to visit. 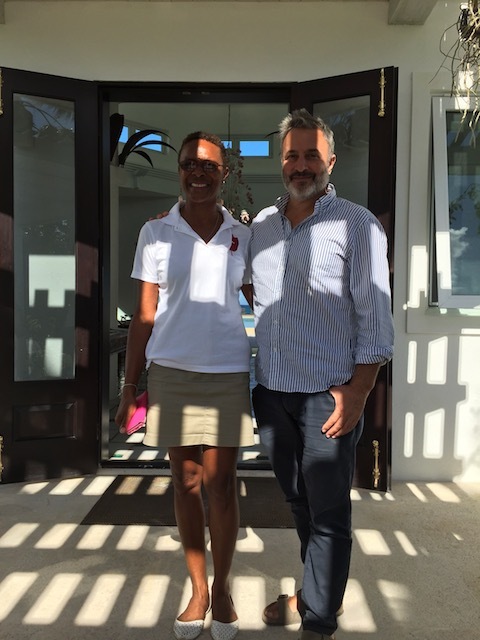 The chef is a local lady called Monique – and she has plenty of experience working in restaurants here in Eleuthera. With what we have tried so far ourselves and from reports we have had from other visitors she is a very talented lady – she worked in conjunction with Tom to design the menu and the offer is healthy and something a little different from what is generally available here. 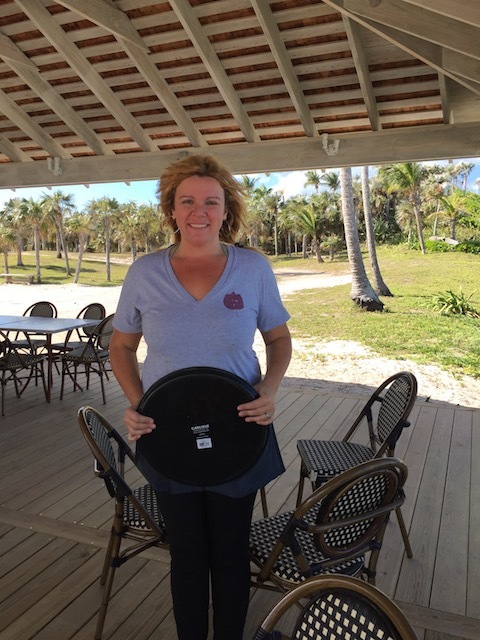 Jennifer Hadland is the hotel manager – a lovely friendly lady with an eye for detail and high standards – I’m sure that under her eagle eye the hotel and restaurant will maintain great standards even when Tom is off island….. There is a stunning swimming pool as you will see from the pictures – and Tom is going to introduce the option of visiting La Bougainvillea as a day club guest – paying a small fee for each person so that you can use the facilities and eat and drink as well. 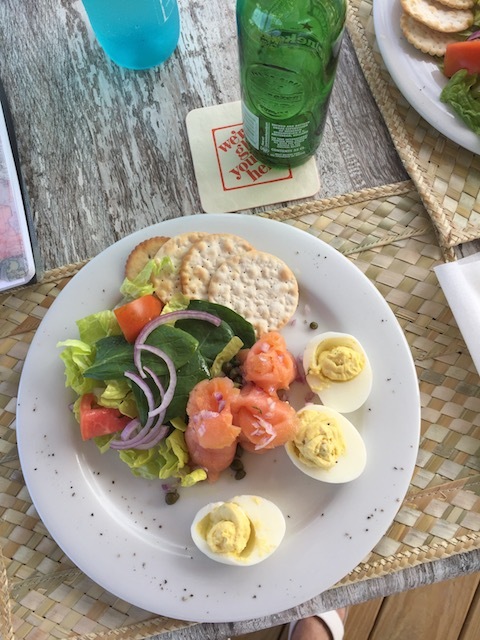 There is a plan for walking trails as well as mountain bike trails – and mountain bikes to rent…..
La Bougainvillea is open for lunch from 12- 3pm and dinner from 5-10pm – every day except Wednesday. For bookings call 242 699 6301 – tell them Kathy sent you ! No blog is complete without a picture of our growing boy Rudge ! Looks like a gorgeous property. Nice to have another option for good food and ocean views. Thank you. Nothing makes me happier that to write about a new place to eat here – well actually eating there does but you know what I mean ! Isn’t it exciting to have a new option ! 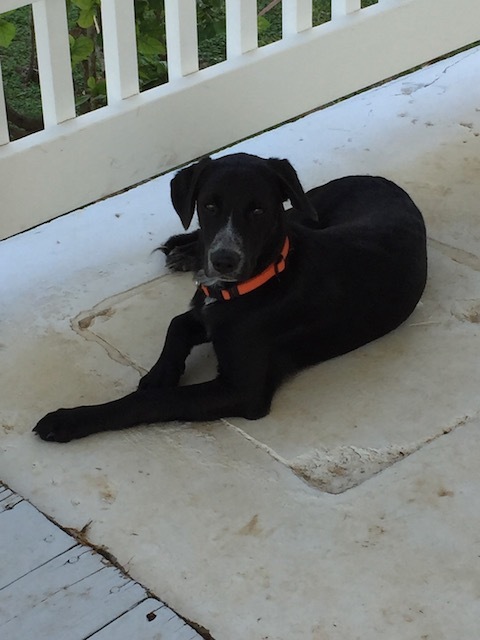 And we love Joanie as well – she is a great addition to the team there. Seems like an age ago since we used to go to Dolce Vita doesn’t it ! I had the curried grouper and asked for mine to be mild. 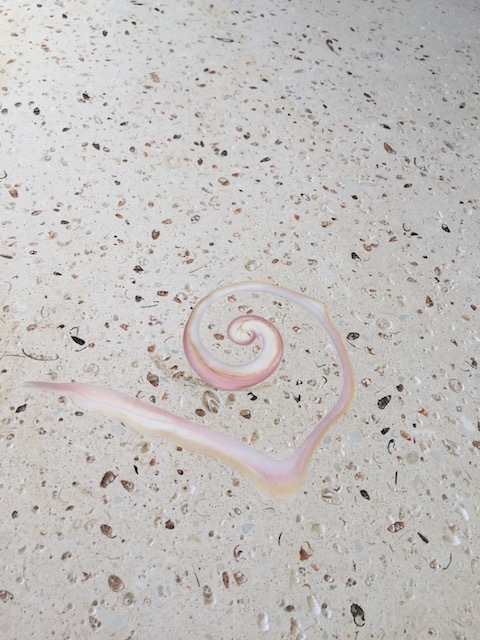 It was perfectly delicious. Monique is happy to prepare it to ones liking. The day pass (trails included ) would be grand. Cathy,Thank you for another completely helpful review. That’s great to know – we are going tomorrow evening – looking forward to it ! Glad you are reading the blog ! Yes – I do get them and approve them as well – please do keep on commenting ! Very excited to enjoy the restaurant especially for Thursday night Pizza!